Stanley Pattison sent this postcard at Christmas 1915 from Kenya, obviously keen to do his bit for King and country. He survived the war. 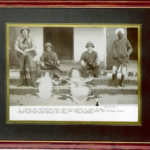 Framed photograph with alligator "trophies.